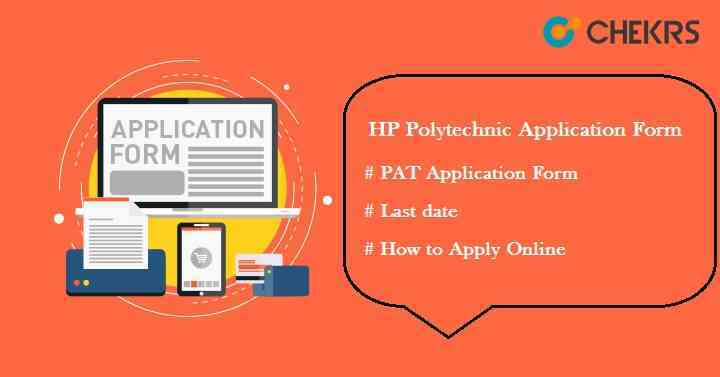 HP Polytechnic (PAT) 2019 Application Form: Himachal Pradesh Polytechnic Admission Test (HP PAT) is a polytechnic entrance test providing admission in diploma courses. This exam is regulated by HP Technical Education Board (HPTEB), Dharmshala. Through this exam, candidates can get admission into various government and private polytechnic colleges of Himachal Pradesh state. HP PAT is held once a year for interested candidates and permanent residents of HP. The official authority of HP Takniki Shiksha Board will release the application form in the month of April on its official website. HP PAT Application Form can be filled through online mode only. Check all the important information about the exam dates, eligibility criteria, and application form filling procedure here. Check here all the tentative dates of HP Polytechnic 2019. All the interested candidates are advised to check the HP Polytechnic Entrance Exam Eligibility Criteria before applying for the HP PAT 2019. Candidates should have domicile of Himachal Pradesh state. Candidates must have secured at least 35% aggregate in the qualifying exam. Applicants should have passed class 10 or equivalent examination from HP state board or any recognized board. Candidates appearing for 10th exam or equivalent examination can also apply. Candidates can deposit the HP Polytechnic Application Fee through online and offline both mode. Fee will be different for different category. Check the examination fee in the given table. Students need to visit the official portal of HPTEB i.e. hptechboard.com. Click on Online Admission 2019. Click on Polytechnic Admission (PAT-2019). It will redirect to next page. Now click on Polytechnic-PAT 2018. Go to Online Services, Click on “New User Registration”. Registration Page will open, enter all the details and then click on submit button. Email or SMS will be sent on the registered mail id & mobile no. Now, Login into the account with the login credentials sent to you and then click on login button. After login, click on the link “Apply Online”. Fill the application form with all required details like select examination station, personal information, academic details, contacts etc. Upload photo without spectacles and signature in the given space according to the given description. After uploading images, next process is to pay the fee. For offline, download the Challan and take the print of it. Go to your nearest bank, pay the fee through Bank Challan and get a transaction reference number. Enter the received transaction Id/No., Date of Deposit, Bank name and Branch name in payment detail option and then click on “Submit & Print Receipt” button. For online process, click on “Online Payment” option. Select payment option such as Credit Card/Debit card/ Net Banking, enter asked information. Take the print of Application Form after successfully registration for future use.